starting a salad swap | happy stuff. at the beginning of this summer, i was reading a blog (sorry, can’t remember which one) that made a passing comment (i believe it was facetious) that her new diet plan was “eat a salad every day.” while this “diet plan” came with absolutely zero further explanation or scientific back-up, it seemed like a pretty solid goal nonetheless. i was ashamed to think about how many days sometimes passed between salads in my menu. i decided to try eating a salad every day (or at least closer to every day) for awhile. trouble was, i didn’t want to eat the same salad 5 days in a row and i didn’t want to have a bunch of rotting produce in my refrigerator and so the concept of the salad swap was born. 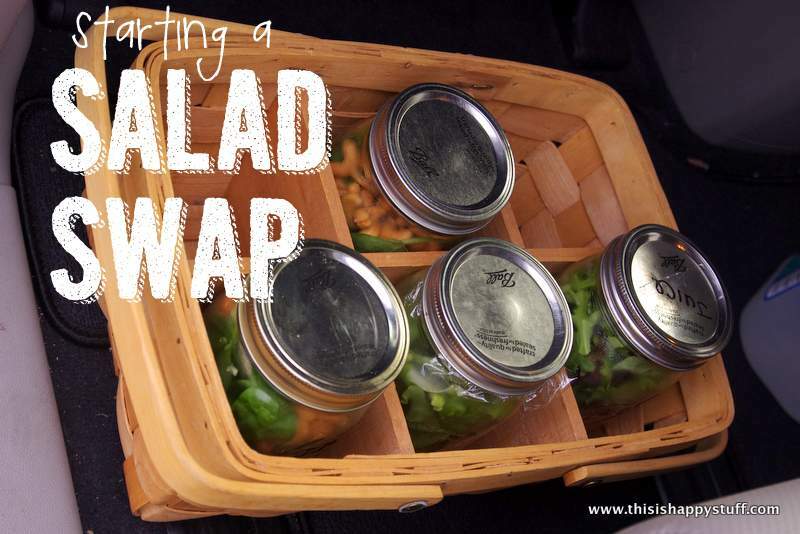 1. we decided to swap mason jar salads. 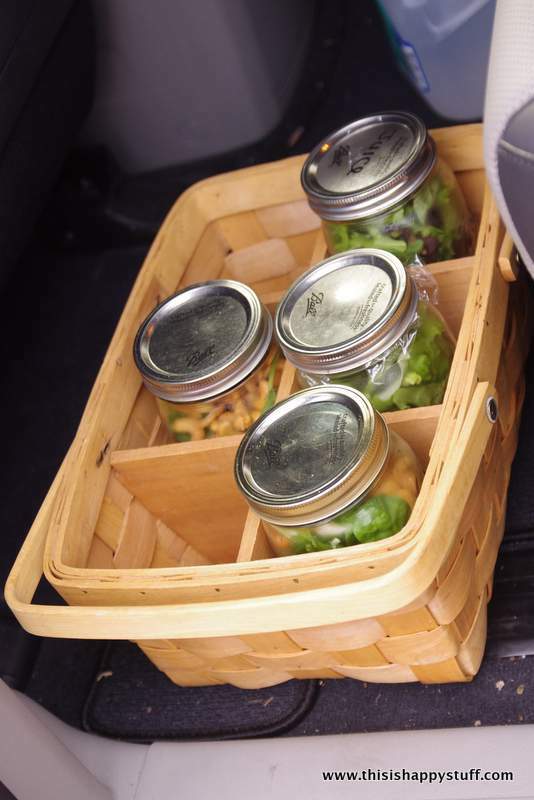 everyone needed to find wide-mouth mason jars, as many as they want to swap each week. 2. if anyone wanted to join the swap but had dietary restrictions or preferences, they needed to give the group a heads-up so that things could be left out of one jar for them. 3. each week, whoever is in town and wants to participate brings as many jars as they want to swap. i usually aim for 5 days a week, so i make 5 jars of the same salad and take 4 to church to swap and keep one jar of my own salad at home. some weeks there might only be 3 participants and we take home a few duplicate salads. other weeks, there are 6 or 7 people participating and we choose whichever salads look tastiest to us. 4. we agreed to be honest with feedback as we were all learning together the best way to build a salad in a jar. so if by day 5 the nuts in one of the salads had lost their crunch, or if the avocado had turned unappealingly brown, we sent an e-mail and all learned that maybe twisting some of those ingredients in a bit of plastic wrap and tuck them into the top of the jar, they last a little longer. i found this blog post particularly helpful. 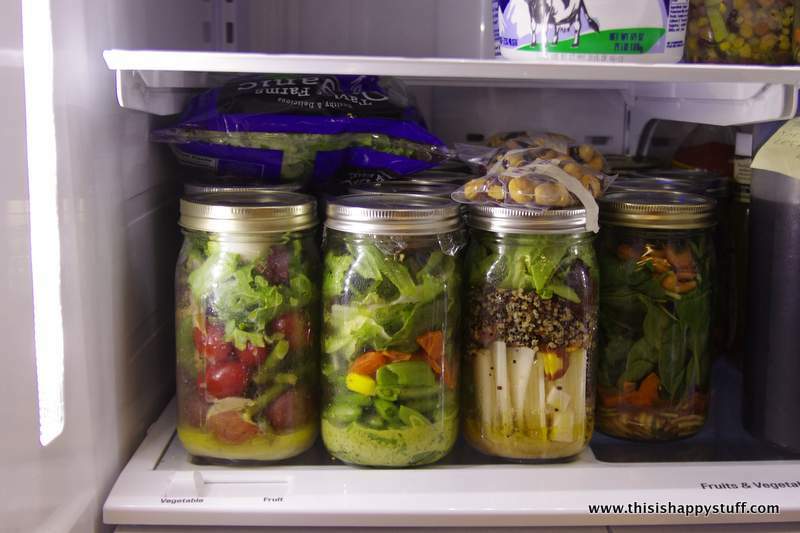 5. each week, anyone who wants to swap, tucks their salads into the refrigerator at church and right after the service, we meet up in the kitchen to swap jars and let others know if there’s any special notes (e.g. “mine has avocado, so you might not want to leave it until the end of the week”). although a church-based swap works well for me, i could see this also working well with a group of co-workers or neighbors. everyone in our swap has been so excited about this idea. it feels “like christmas” to find out what salads we’re getting each week! i think each of us try to make an extra special salad since we know we’re sharing it with others and there have been some truly incredible combinations (i still can’t stop thinking about the one that had a curry dressing, chickpeas, crunchy roasted almonds and homemade pickles. sooooo good!). 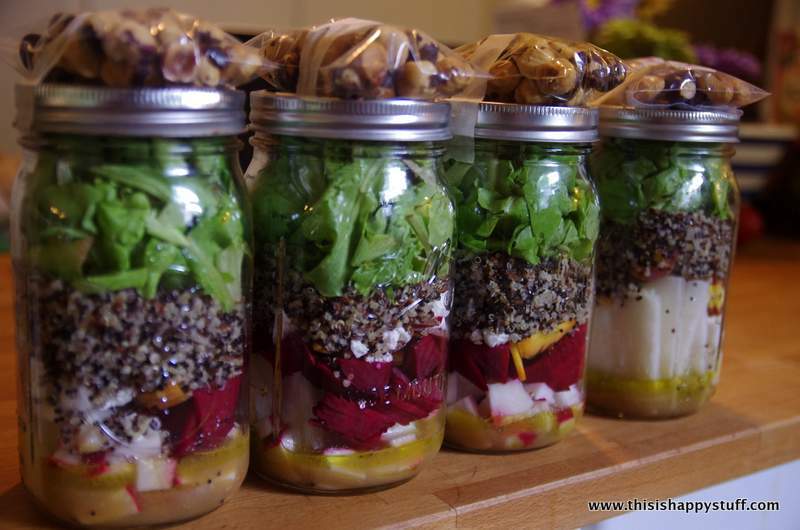 and it’s so easy to grab a jar each morning while packing lunches for work! yes, i’d say that prep-time on sunday afternoons can sometimes take an hour or more, but that’s usually my own fault for picking complicated recipes. our family is also trying a csa for the first time this year and i’ve enjoyed the challenge of finding recipes that match the contents of our box each week. i also finally found a use for this basket that i think was a wedding gift. i think maybe it was supposed to hold silverware or napkins for a picnic, but it works great for hauling jars safely to church each week. i highly recommend trying out a salad swap for yourself! 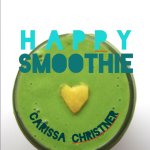 This entry was posted in clean, summer, yum. Bookmark the permalink. yay for details! i may see if i have any takers at church, too!